Upgrade the look of your living room with this pendant lamp. Made for indoor use, this lamp has multidirectional lighting, which provides ample illumination for the entire space. 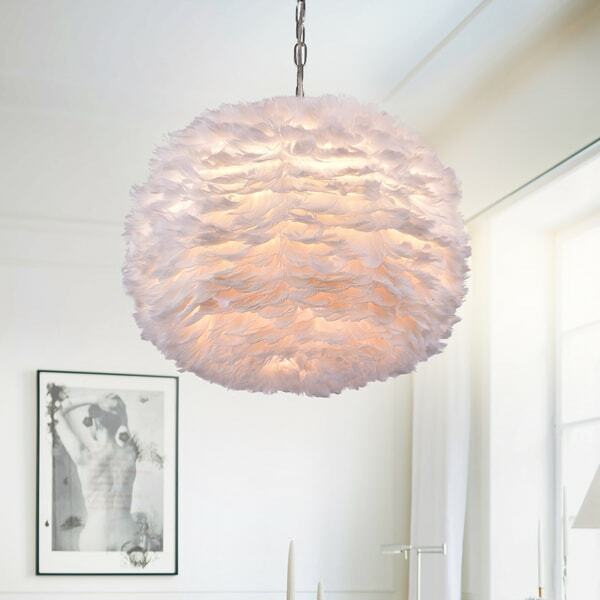 Crafted in a three-light design, this elegant lamp features a feather shade to reflect light. This lamp also features a metal base with a chrome finish, which gives it a sleek, upscale appearance. Dimensions 18.0 In. X 18.0 In. X 45.0 In. This light is fabulous. I have a coverted bedroom into my closet where I have this light. It is bright enough for the room and looks wonderful, very light and fluffy! I get so many compliments on this light fixture—it’s pretty much the girliest thing ever, but you knew what you were getting into when you clicked on “feather lamp,” didn’t you? :) Not very bright, but so pretty. This is a very pretty fixture. It looks just as described and the feathers are very soft! Dimensions are correct, and it works perfectly for where I intended it. "Is the overall length adjustable? Can you make it shorter?" "How bright of a light can we get with this? Is this gona give enough light a a lrge living room"
"are these feather synthetic or real?" "The descripton says that the light is 18 to 36 inches wide. What does that mean? Is it 36 in diameter? Please clarify."